September is always a busy and exciting month for Kwanalu as it sees the sitting of our annual Congress. This year, Congress took place at the Royal Show Grounds on Thursday, September 20 and saw over 260 delegates including chairpersons of all farmers’ associations, industry leaders, agribusinesses and students from Owen Sithole, Cedara and Weston Agricultural College in attendance. 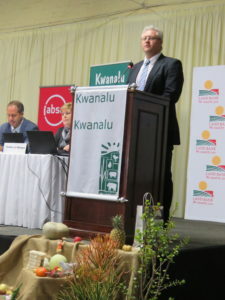 The theme of Congress this year was “Harnessing our collective power to be an authoritative force”, and was addressed by all speakers of the day and focused on the importance of strategy, change management, leadership and the role farmers and the union play in influencing the economic, legal and social environment in which the agricultural sector must function in order to ensure economic productivity going forward. Guest speakers included Agri SA President and farmer, Dan Kriek who spoke directly to fellow farmers on the positioning of organised agriculture in the context of current issues affecting farmers including expropriation without compensation. He encouraged farmers to communicate as a means of moving the industry forward and to support the structures of organised agriculture. “I call on you all to support your leadership, to support Kwanalu, to support the chairpersons of your local farmers associations. It is an extremely difficult time to be a leader in agriculture in South Africa and we need you to trust that we have structures in place and that we will work according to our mandates as instructed by our members. 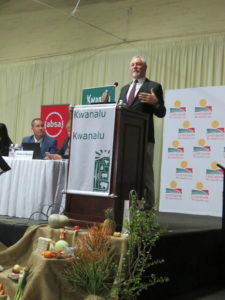 I call on you to communicate and be part of the plan for the future of agriculture, to recognise the injustices of the past and in doing so please know that I will defend the whole of the Constitution and I will demand respect for our farmers, for the industry and the valuable role we play in the country,” said Kriek. 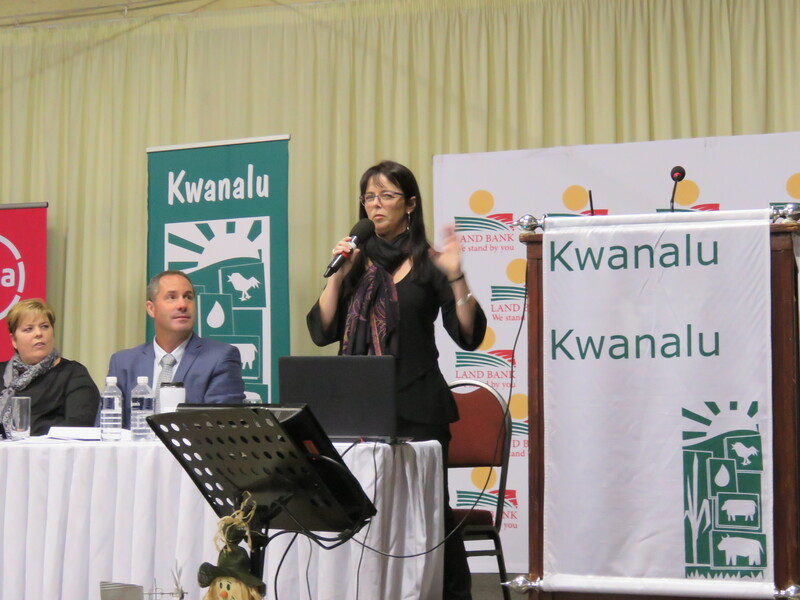 Political commentator and leading South African journalist, Melanie Verwoerd spoke candidly to farmers about the critical role they play in ensuring the stability of the agricultural industry in the context of transformation and correcting the injustices of the past. 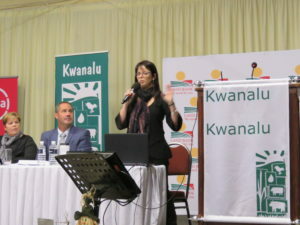 She appealed to farmers to remain calm and not to become reactive to rhetoric in the media, advising them instead to be careful with whom they align themselves with, encouraging them to support Kwanalu and Agri SA as a united, organised voice of agriculture. Strategy, leadership and transformation specialist Dr Mark Manley reminded farmers that significant growth takes place outside one’s comfort zone, and called on farmers to take responsibility for the change that needs to happen in the sector. “If we continue to think the same, we will continue to do the same and as a result we will continue to be in the place. Unless you change your thinking, nothing is going to change,” Dr Manley told the audience. President of Kwanalu, Andy Buchan ended precedings saying, “Agriculture needs to be resolute upon the principles which underpin our organisation and to exercise leadership in the pursuit of creating an enabling environment for future generations and to always have hope”. 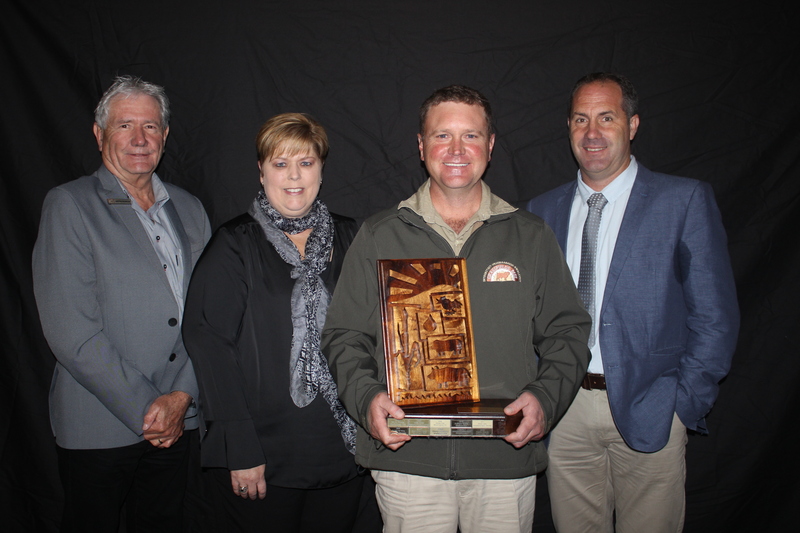 The much-anticipated announcement of the Kwanalu 2018 KZN Young Farmer of the Year was also announced with the honour going to northern KZN commercial beef and Droughtmaster stud farmer, Rustin Shawe (37).